In today's instant gratification age, handwritten notes are a lost art. Even the term snail mail has a negative connotation. Still, the unexpected treat of opening a mail box and finding a personal note can bring a smile. So why do we overlook this forgotten pastime? Handwriting a note takes time and care. There is no autocorrect for spelling mistakes. There is no cut and paste salutations or common phrases. The whole experience takes effort from pen to paper to stamp on the envelope. While people may disagree on what type of paper to use, a good pen is important for the task. A few key aspects to a good pen is how it feels in your hand, whether it will smudge and cost. It may sound silly but cost should be a factor in choosing a pen. Not many people can or will want to spend a significant amount of money on a single pen. What if it is lost, stolen or otherwise misplaced? Bic offers a variety of pens that are cost effective. The BIC Comfort Ball pen offers an extremely comfortable grip. One common complaint with pens is that your grip can become uncomfortable over time. This pen offers a soft, yet easy to use comfort grip. The pen offers smooth, long lasting ink. The retractable feature allows for protection when that pen ends up at the bottom of a purse. From the quick signature to the long, romantic prose, this pen will keep the words flowing. 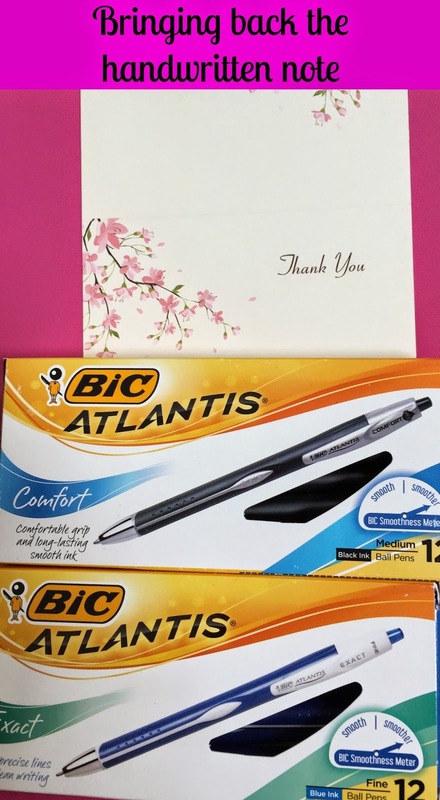 Another good option for a writing pen is the BIC Atlantis Exact Retractable Ballpoint pen. This pen offers more precise writing. Occasionally I have to fill out school or sports forms. With this pen, the sleek, smooth writing easily fits into the tight, small writing spaces. The retractable feature also protects from the lost caps that can ruin the inside of a purse. This pen is perfect to keep in the car for those school forms or quick reminder notes. BIC offers a wide variety of writing utensils. From a 2-in-1 pen, which is perfect for using with electronic devices, to BIC window markers, for fun notes, drawings and silliness for the family, BIC has a solution for any occasion. All of these items can be purchased at Shoplet.com. Shoplet offers all types of office supplies for both the home and work needs. Bring back the long lost art of the handwritten note. The surprise in the mailbox might be the highlight to someone's day. Disclosure: The reviewer received these items for the purposes of this post. All opinions and thoughts are her own and were not influenced by anyone.